Christina Lee: Animals as MC's? One of my favorite books of all time is WATERSHIP DOWN! I know some will disagree, especially if it was assigned reading in school. The story follows a warren of Berkshire rabbits fleeing the destruction of their home by a land developer. As they search for a safe haven, skirting danger at every turn, we become acquainted with the band and its compelling culture and mythos. Adams has crafted a touching, involving world in the dirt and scrub of the English countryside, complete with its own folk history and language (the book comes with a "lapine" glossary, a guide to rabbitese). Yep, a book about rabbits. And I read it twice! A few pages in, the focus becomes the personalities and the story-line. Not the fact that your reading about rabbits. That's good writing. **What's bittersweet is that I found the book in my deceased brother's possessions (he died when I was 21). I will always, always cherish that book. Anyway, animals as MC's. I won a book on LiLa's blog last week: NIGHTSHADE CITY! Deep beneath a modern metropolis lies the Catacombs, the kingdom of remarkable rats of superior intellect. Juniper and his maverick band of rebel rats have been plotting ever since the Bloody Coup turned the Catacombs, a once-peaceful democracy, into a brutal dictatorship ruled by decadent High Minister Killdeer and his vicious henchman, Billycan, a former lab rat with a fondness for butchery. 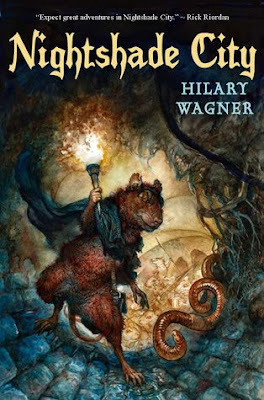 When three young orphan rats--brothers Vincent and Victor and a clever female named Clover--flee the Catacombs in mortal peril and join forces with the rebels, it proves to be the spark that ignites the long-awaited battle to overthrow their oppressors and create a new city--Nightshade City. Yep, I've got some reading to do! I agree with you on Watership Down. It has been one of my favorites since Jr. High. I've never read it, but it sounds like something I would like. Wait..do any of the bunnies die? Because I don't like books where little fuzzy animals die. I can't even watch Ol' Yeller! Or Bambi! I don't think I've read Watership Down but I would have had NO CLUE it was about rabbits from the title! I absolutely love Watership Down. I never read it when I was younger and Jon bought it for me last year. I couldn't put it down....just love it! I haven't read either of these! :/ I'll have to check them out. 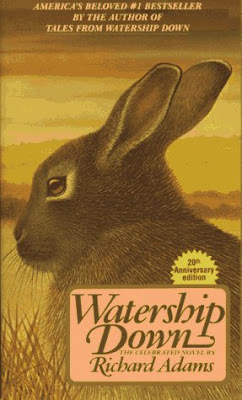 Watership Down is one of my favorites too, I think I've read it at least five times! Happy reading with the new one! Can you believe I've never read it? It is in my TBR pile now though as my daughter just read it in school. I never read Watership Down. Nightshade City is on my to-read list. I loved The Miraculous Journey of Edward Tulane by Kate DiCamillo, which is about a rabbit toy. Gregor the Overlander had many animals in it too, and that was a fun read. I have to admit I've never read Watership Down (*hangs head in shame*), but I definitely do need to! I haven't read that book but it does sound interesting. I'm so happy that you found the one that your brother had. So sorry about your loss. I normally don't like books with animal MC's, but I did like Nightshade City. I adore that book! Read it with my mom when I was a kid. Great memories! I've never read Watership Down (I will soon, I promise! ), but I used to read the Redwall series with mice and badgers and otters and everything. Totally loved it. I've never read Watership Down, but I saw the movie. I cried. A lot. Didn't help that I had rabbits at the time. I love Watership Down... and I sympathize with the teachers who decided to assign it to poor people who will never like assigned material--'cause it is just that good. And I can't wait to read Nightshade City, either! I remember Watership Down, but I didn't remember the plot. Now I want to go read it. How about Mrs. Frisby and the Rats of NIHM. Mice and rats...and an owl, a crow, and a big fat cat.